So a few weeks ago, my mom came to visit us and I finally got a chance to participate in my birthday surprise Mr K so dutifully kept a secret. 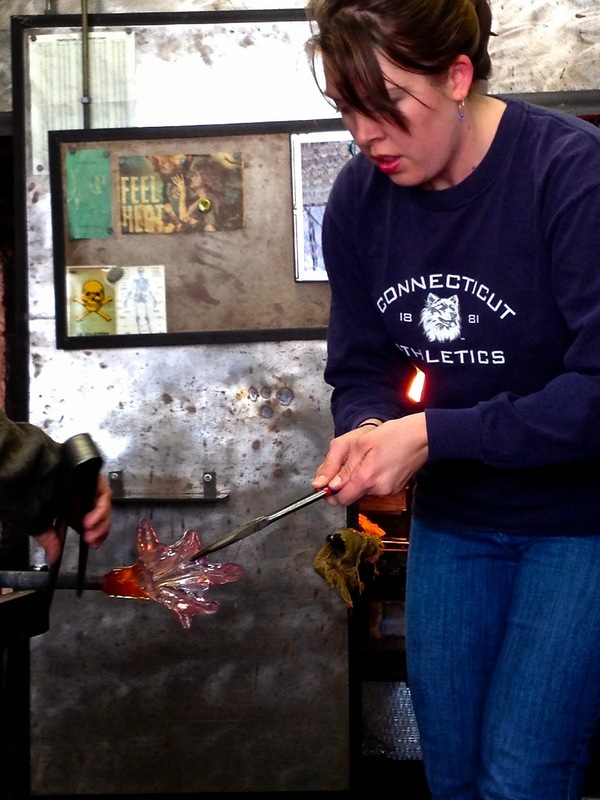 Turned out we were going to make glass flowers in Santa Fe with the artist, Elodie Holmes. You can read more about her here. Trust me, she's amazing. Anyway, we pulled up to the studio and got taken right to the firing room. 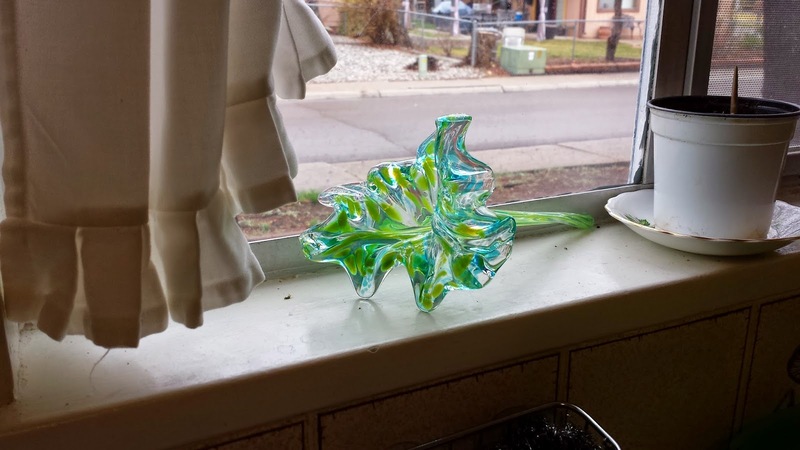 The glass frits were already on the table when we walked in. So pretty. It was hard to choose two colors. The class made two flowers a person and we were told to choose two colors per flower. Decisions are not my strong point, just going to say. But I managed to pick some after a little hesitation: aqua and purple, and then teal and bright green. A grandmother and her 10 year old granddaughter went first. The instructors made it look so easy. But mom was a trooper with her Bruins colors. Yay UCLA! Then it was my turn. 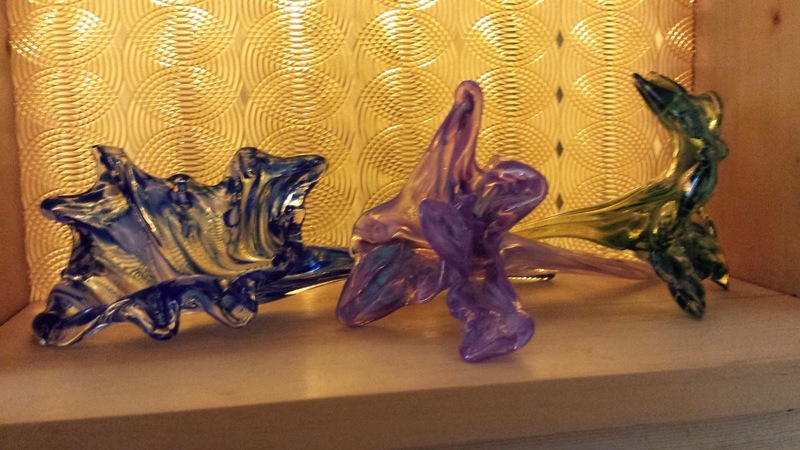 You gathered some molten glass on the end of the rod and then smushed it into the glass frits. Then you put it in the hot oven to melt the first of the frits (say that ten times fast). After it was melted, all the while turning, you came back and added your second color. Turning and turning, you take it back to the little oven and melt it again. Then one person rolls it on a stand while you snip with just dunked in water pliers. I'm smiling because that's the easy part. Then it goes back in the fire and you dunk the pliers. It comes out again and you then take the pliers and pull the glass like taffy. But you have to be quick otherwise the glass cools too much and shatters. No more smiling, just concentrating. Then you pull the entire flower off and Elodie took it from there, cutting it off the rod and blow-torching the rough ends. Mr. K was after all of us, and of course, towered above the instructor. 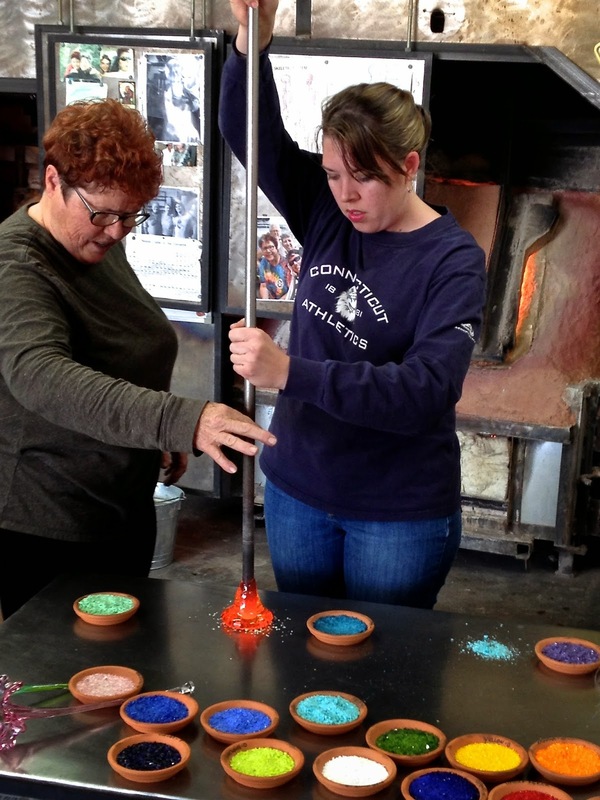 I love this shot of the glass going into the kiln. Here's Elodie breaking the flower off the rod just by adding a few drops of cold water to the base of the stem. Then she used the blow torch to smooth the rough edge away. After that she put them in a hot oven where the temperature would gradually drop over time and cool the glass flowers without shattering them. We were told to wait until the next week to pick them up, minimum 48 hours so that they would be completely done. Fine by us. 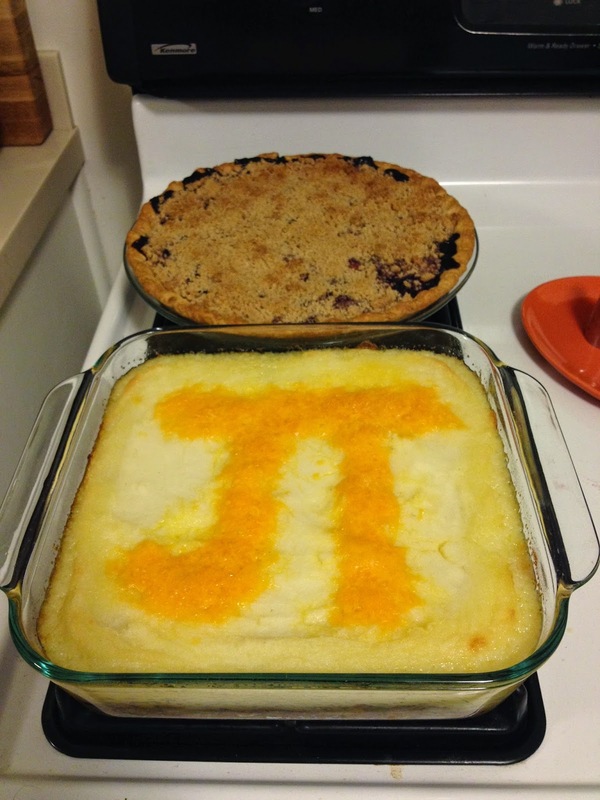 We had other things at home to do...like celebrate Pi(e) Day! And how do you do that, you ask? Why with Shepherd's Pi(e) and Berry Crumble Pi(e) of course! This year was epic. March 14, 2015. Or... 3/14/15. But only if you do it the American way for the date. The European/ rest of the world way wouldn't work. Anyway, that Tuesday we were able to go get our flowers! I love how each flower turned out different. And the colors are really pretty. Great job, Mr. K.
A few days later we returned to Santa Fe to go to a great little place called Jackelope's. For those of you unfamiliar with the legend of the jackelope, it's known as the "warrior rabbit", with antlers sprouting from it's head that he's not afraid to use in a fight. Anyway, at the fun store, they didn't have jackelopes, but prairie dogs that you could watch! I've never seen a prairie dog. EVER. I wanted to take one home, but Mr. K said Mochi might not enjoy that. So I had to bid adieu to the prairie pups. The cool part about this store is that it is not really one store but many. They even had a section devoted to petrified wood. I got really excited because we're going to see the Petrified Forest this July. Yay! And turning around, I saw the classic windmill, complete with cow skulls. You can't get more Southwestern than that! We went into another store on the property and this wall was perfect. The drive home was fun, seeing the approaching thunderstorm. What's neat where we live is that it can be gorgeous and sunny ten feet from the darkness. Or, better yet, like this shot. We stopped at the overlook coming up the main "hill" (mesa). The rocks are naturally eroded with holes. It's so interesting to photograph. But I personally love this view best. The mountains in the distance are the Sangre de Cristo mountains. Group shot from the roof of our car before the rains came. We went all over Northern NM with my mom, even got some wine tasting in (which if you didn't know, NM has some good wines). But after a glorious stay with us, she had to return to FL. It was a sad day, but I'm so glad she came to see us and got a taste of the Southwest where we live.